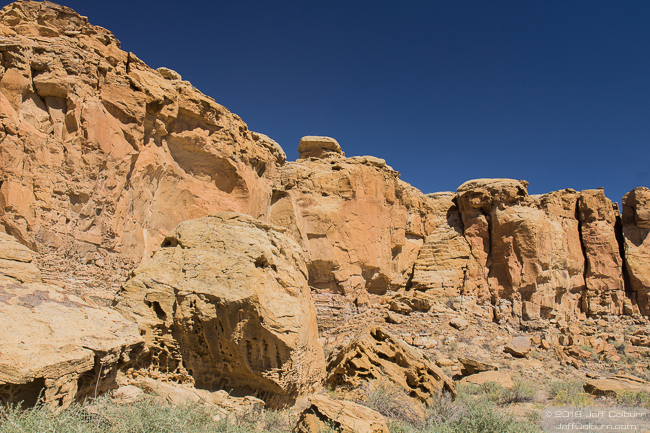 Look very closely at this photo of the Chaco Canyon Pueblo area in New Mexico. Just to the right of center, do you see those horizontal lines working their way up the cliff? Those are stairs. The Native Americans built roads that connected the pueblos in the area. When they came to a cliff, they would either build a ramp or stairs. This allowed people to easily walk from one pueblo to another. That is amazing enough, but the roads, and these stairs, are 30 feet, (9 meters) wide. That’s an amazing feat of engineering. On some occasions, they would cut foot and hand holds, small holes, in a cliff instead of stairs. Imagine strapping a basket onto your back, that’s filled with 20-30 pounds (9-13.6 kilograms)of stuff, then climbing a vertical cliff and not having the basket pull you off the wall. I’ve done some mountain climbing and bouldering, and it was tough enough with nothing on my back.